Review Summary: ROCK ON!! is an amazing experience. The highpoint is the emotional quotient the skilful performances and the superb execution of the subject. The film traces the relationship between the four buddies from college days until their stagnant thirties when the band has been disbanded due to interpersonal rivalries and the foursome has drifted apart. You’re hooked by the time the opening scene unfolds. ROCK ON!! is an amazing experience. The highpoint is the emotional quotient the skilful performances and the superb execution of the subject. Rock On is feel-good in the best sense of the word. I enjoyed it immensely and I strongly recommend that you see it too. The script is crisp, tight and is like a breath of fresh air and the feel is overall chick and classy. Strongly recommended for youngsters, don't miss it!!! Let's directly get to the point. Compromise toh karna padhta hai. Finally the big day has arrived. 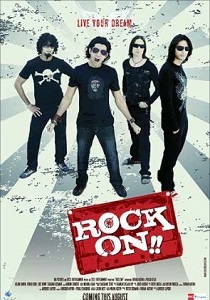 With four Hindi films at the box office this week , all eyes are on 'RockOn' for the obvious buzz it has created. The surprising fact is that the most awaited film of the year doesn't feature a 'Khan','Kapoor'or 'Kumar' . All that hype with relatively new actors and a director whose previous film 'Aryan' was a wash out.